I could easily eat all of this immensely tasty and very healthy avocado and bean salad on my own. I just love it. There are so many types of food that I simply adore – beans of all different kinds being one of them. I started out using edamame beans for this salad but since reading a lot of negative information about soya, I'm using broad beans (fava beans) instead. There are a lot of nutritionist who are saying that the only soy products which are good for your health are fermented miso, tempeh, natto and soy sauce. I've decided to stop using any other soy products. Broad beans (fava beans) are a good vegetable source of protein and fibre and they are rich in folate and b-vitamins. They do require a bit of work - double podding if still in their pods - but they are well worth the effort. And maybe we need to ask what kind of life we lead if we haven't got time to pod? As for salad dressing - I do not drown my salads in it but simply sprinkle some on top. I would not use all of the dressing in the recipe for this avocado and bean salad – any left-overs of the dressing will keep for a couple of days. 1. If the beans are still in their pods, open up the pods and remove the beans. Cook the broad beans in a pan of simmering water for 2-3 minutes if fresh, 4 minutes if from frozen, and then drain. Once the beans are cool enough to handle, peel off the skin of each bean (the skin slips off easily when you pinch the ends). 2. Place the sunflower and pumpkin seeds in a non-stick frying pan and dry-roast them over a moderate heat, stirring every now and then, for about a minute until the seeds start to brown a little. Be careful that they don’t burn. Once done, transfer the seeds to a plate and let them cool down. 3. Make the dressing by placing the mustard, pepper and the vinegar in a bowl. Whisk the ingredients together and keep on whisking while very slowly adding the oil. Add the water and whisk again. 4. Halve, peel and take out the stone from the avocado. Cut the avocado into cubes on a cutting board and squeeze over the lemon juice. 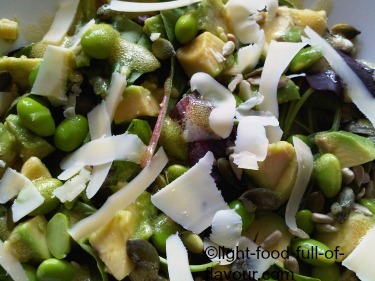 Place the lettuce leaves in a bowl and add the avocado and broad beans. Sprinkle over the sunflower and pumpkin seeds and drizzle over some of the dressing. Scatter the cheese shavings on top of the salad.